The Litetrek III Tent is a three–person, double wall tent, designed for lightweight trekking in alpine terrain, where protection against severe weather, wind stability, light weight and compact pack size are key. Its three–season spec is optimised for use during the milder months of the year. Wind–tunnel tested for stability at 90 km/h by the Technical University of Munich. Its robust, reliable semi–geodesic, double wall construction puts two layers of fabric between you and the elements, enables full use of space and ensures an optimal balance of weather protection and ventilation. The 100% self–supporting design means that you can pitch without problem on rocky terrain, or at alpine sites where there is not enough space to set up with guy lines and pegs. Alternatively, the anchor points can be extended for more flexibility, for example on snowy terrain. Its very tear–resistant 50D ripstop polyester flysheet is PU–coated to give it a 3,000 mm water column, the floor is made of robust PU–coated 70D ripstop nylon that gives a 5,000 mm water column, while the 66D ripstop polyester inner tent has a mesh and mosquito net entrance. Ventilation is regulated via a rear panel with zippers (which can be operated from both inside and outside) allowing you to adjust the fresh air supply and prevent humidity. 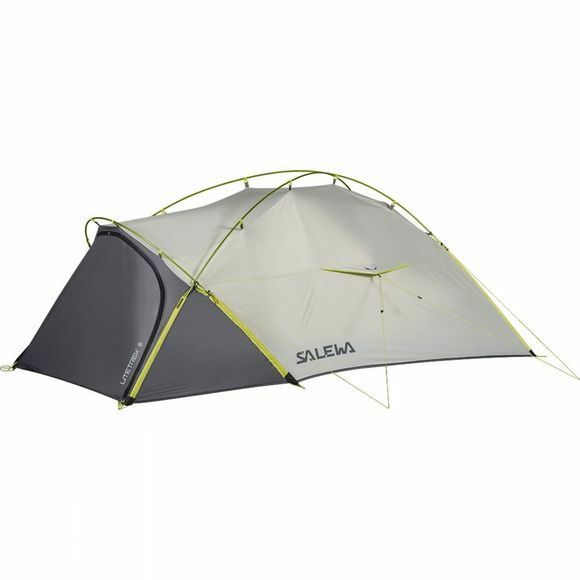 In addition, Salewa's 3S Speed Set Up Solution with short, flat sleeves and hooks allows you to set up fast and effectively in one pitch. And in good weather or on fine nights, you can go minimalist and pitch the flysheet on its own. See also the weatherproof vestibule for gear storage and cooking, which is integrated into the inner tent, or can be extended as required.